Tune in Tuesday at 8:30 PM on ABC. Then join us for Fresh Off The Show. ABC's hit Asian American family sitcom Fresh Off The Boat airs Tuesday nights at 8:30pm, right after The Muppets. The comedy, inspired by the memoir of chef Eddie Huang, tells the story of the Huang family, a Taiwanese American family getting their immigrant hustle on in suburban Orlando, in pursuit of the American dream. If you missed last week's season two premiere, it's available for viewing on the ABC website. Fresh Off The Boat stars Randall Park as Louis, Constance Wu as Jessica, Hudson Yang as Eddie, Forrest Wheeler as Emery, Ian Chen as Evan and Chelsey Crisp as Honey. With special guest assist, as always, from Lucille Soong as Grandma Huang. In this week's episode, we get a tribute to Boyz II Men. Yessss. Eddie learned the word "no" and Jessica is not happy about it. #FreshOffTheBoat is all-new Tuesday on ABC! Nicole convinces Eddie to ditch piccolo and become her tutor, then ends up ditching him when she meets a new boy. Crushed, Eddie stops eating and listens to Boyz II Men's "End of the Road" on repeat. Jessica is confused by his behavior and seeks parenting advice from Honey. Meanwhile, Louis longs for a daughter which makes Emery and Evan panic that they will be forced to move out of their room. Guest starring are Lucille Soong as Grandma Huang, Kimberly Crandall as Lisa, Rachel Cannon as Deidre, Stacy Scowley as Carol-Joan, Colleen Ryan as Amanda, Ray Wise as Marvin, Luna Blaise as Nicole, Prophet Bolden as Walter, Trevor Larcom as Trent, Dash Williams as Brian, Evan Hannemann as Barefoot Dave, Matt Kuhn as Hoagie King, Matt Lucas as Mr. Fisher, Anthony Keyvan as Chris, Isabella Crouch as Alison, Shu Lan Tuan as Grandma Chu and Nick Gore as Ned. 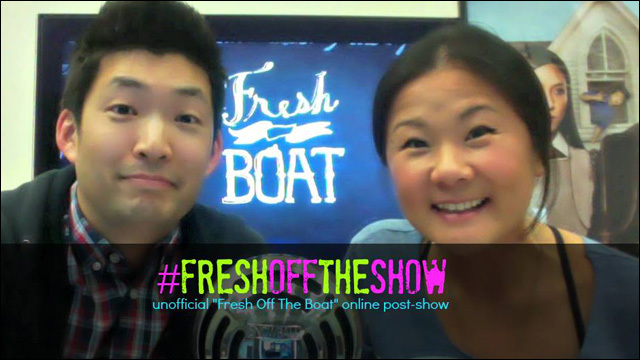 Immediately after watching and live-tweeting #FreshOffTheBoat, hop on the internet and join us for this week's edition of Fresh Off The Show, the unofficial Fresh Off The Boat after-show, streamed live on YouTube. Co-host Jenny Yang and I will recap the episode, offer commentary and eat some Asian snacks. We'll go live at around 9:05PM Pacific Standard Time, right after the west coast broadcast of Fresh Off The Boat. For further details about Fresh Off The Show, visit the Facebook event and spread the word.